On the Templates page you have the option to select the templates that will show up for both the Photo Overlays and the Lower Content Templates. This page is accessed via Settings -> Ad Templates. These templates will be those that show up with images overlaid on the initial photo in the Craigslist ad. There are many styles of templates that you can choose from including Calls to Action, Financing, Disclaimer and others. You also have the option to select ‘Custom’ and free pick which templates you would like to use. These Templates will be those that show beneath the Photo Overlay templates. 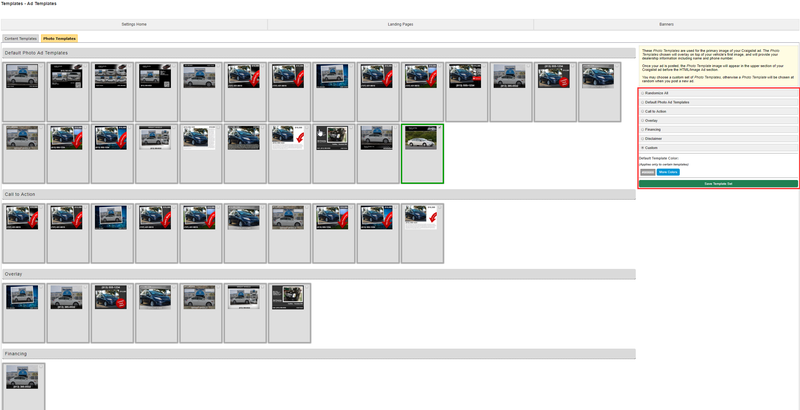 There are many different variants of lower content templates that will determine which information will be shown.